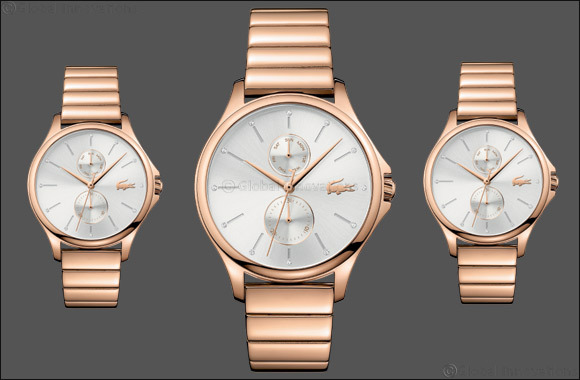 LACOSTE reveals a new feminine watch collection - the Kea family! Dubai, UAE, March 18, 2018: The collection sublimates with refinement and subtlety the wrist of any woman in love with modernity as well as tradition. Discreet but remarkable, this watch is based on the timelessness of rose gold IP plated round cases adorned with a sunray dial. It is enhanced by embossed indexes highlighted by sparkling Swarovski crystals and two minimalist counters indicating the day and date. Dressed in rose gold, the hands skim the time with elegance while the crocodile marks the break at 3 o’clock. A new collection designed to rediscover the pleasure of the moment and to watch the time in style. The collection is available at Hour Choice stores across the UAE and is priced at AED 1,065.